Do You Know What to Look for in Your Sunscreen? Just because a sunscreen has made it to the shelves of your local big box store or even to your favorite beauty supply chain does not make it safe, healthy and effective. Some sunscreens do not protect against all of the damaging rays of the sun, and others do not actually contain as much active ingredients as the bottle states. This can lead to significant sunburns and skin damage. The next time you are staring at the dozens of creams, sprays and rollers that line the sunscreen aisle, remember these for finding a great sunscreen. For good daily sun protection, you should look for sunscreens boasting an SPF of at least 15. This number means that how fast you would normally burn is multiplied by a factor of 15. However, even under harsh sunlight, SPF 30 is typically fine for most people. This is because the benefits of SPF do not get significantly higher beyond this point. Those who have already experienced skin damage or who are at very high risk of sunburn may want to use SPF 50 when in bright sunlight. Older sunscreens only protected from UVB rays from the sun. Today, however, scientists have learned how much damage UVA rays can do. The listed SPF will not tell you how much the formula will protect you from UVA rays. If you check the ingredient list though, you will get a good idea as to whether the sunscreen is a safe choice. Some top ingredients for protecting against UVA rays include ecamsule, oxybenzone, titanium dioxide and zinc oxide. While no sunscreen is entirely waterproof, you should look for one that will not wash off instantaneously while swimming or sweating. Look for the words “water resistant” and sweat resistant.” In most cases, be sure to reapply any option after 40 minutes of swimming or after toweling dry. If you suffer from very dry skin or oily skin that is prone to breakouts, you will want to find a sunscreen that addresses these concerns. Choose a face-only sunscreen that will keep your face from getting too greasy. You may also want to find a dry spray option for your body that will provide a matte finish and prevent clogged pores on trouble areas. No matter how good the sunscreen is, you will only use it if you feel good about it. Choose one that has a good feel, a scent that you like and the right price tag. If you like natural, organic products, consider a sunscreen from a natural brand that promises no harsh chemicals on your skin. Another option is an ecofriendly sunscreen. 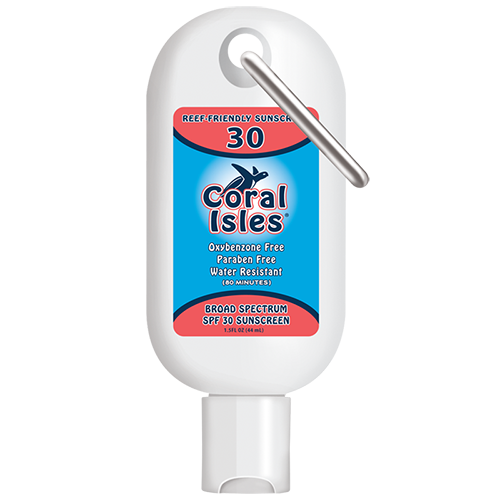 These sunscreens, such as Coral Isles, protect the water supply and particularly the coral reefs from dangerous chemicals that can ruin these beautiful living creations. When you choose a sunscreen, first take some time to determine what is most important to you. Because safety and efficacy are key components of a good sunscreen, check with various consumer reports as to how sunscreens lived up to their claims. Finally, choose one that supports your beliefs and personal needs and that you feel happy to use daily.